Bring the family to Westfield Old Orchard Center (Skokie Blvd. & Old Orchard Center, Skokie, IL 60077, 847-676-2230) for the “Be My Valentine” event! Chicagoland families and their preschoolers have the chance to participate in a free interactve story and crafting time presented by the Skokie Public Library. The hour-long Valentine’s Day themed event, located in Barnes & Noble, will give the kids ample time to play and engage with one another and their loved ones. After story time, little ones are encouraged to paricipate in a crafting session where they can ask someone to “Be my Valentine” and create Valentine’s Day cards for the ones they love the most. The event is part of Westfield’s WFamily Program, a series of free events presented to promote literacy through fun and creativity. All are open to the public and no registration is required. Each event is open to about 50 children on a first come, first serve basis. Mark your calendars for 11:30-12:30 p.m. February 4th. Don’t miss out on this fun and engaging learning experience for the kids! A Great Day for a Kid’s Parade! The Jean Banchet Awards for Culinary Excellence, the local James Beard-like awards of the restaurant world, announced winners at a benefit for the Cystic Fibrosis Foundation on Friday Night. The ceremony was hosted by WLS-TV personality Steve Dolinsky and master sommelier and host of Check Please Alpana Singh at the Fairmont Hotel. Forty-four exceptional chefs, sommeliers, mixologists, restaurants and catering companies provided the food for the annual Chicago awards and, for the first time, the nominating process was open to the public. The event brought together the who's who of Chicago’s restaurant scene and some 700 guests who enjoyed cocktails, appetizers and a seated dinner by guest chefs, restaurants and The Fairmont Hotel. The awards were part of the 15th annual Grand Chefs Gala hosted by the Cystic Fibrosis Foundation and raised close to $200,000 to help fund research to find a cure this deadly disease. Chef Jimmy Bannos and chef/restaurateur Scott Harris were honored with the Founders' Award, awarded to those who "significantly affected lives in a charitable or humanitarian way." Most restaurateurs would agree that any new concept should be fine-tuned during its first year as it climbs up the learning curve and gets to know its customers. This wisdom has not bypassed Mark and Margarita Challenger, owners of Everest Burger, located at 91 Green Bay Rd. in Glencoe, Ill. (847-242-0909). This "better burger" joint, which opened in February 2011, is located on the Winnetka/Glencoe border in the North Shore area of Chicago. The owners are an engaging couple who also own the very popular Guanajuato Contemporary Mexican and Tequila Bar a few doors down from Everest Burger. They have made several key changes during 2011 and the customers couldn’t be more pleased. "We’ve learned a lot during our first year at Everest Burger," said Mark, "and we’ve made some significant changes that will better serve our customers. We’ve moved to a different supplier of beef, changed some of our ingredients, added new recipes, changed our menu presentation, and moved to full table service because that’s what our customers want. We’ve also started daily breakfast service." The core mission of Everest Burger has not changed, however. "Our goal still remains to serve fresh, healthy food that our guests will find to be a delicious, intelligent alternative to typical burger joint fare," he says. The first thing the Challengers did was to review their choice of all-natural beef. "We originally chose a Piedmontese beef that is a very lean, healthy, all-natural product that contains no hormones, additives or antibiotics," said Mark. "It’s a great product, but we found that it was simply too lean to please our customers tastes—they are used to richer beef. 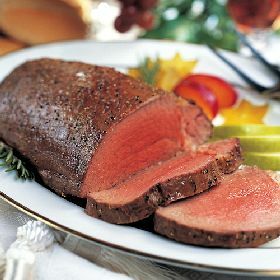 What was missing was the robust flavor that can be found in beef that has a higher fat content." So the Challengers spent several months researching other beef suppliers and eventually chose Missouri-based Rain Crow Ranch. The burgers are now larger and the pricing is also simpler. The regular sized Everest Burger served with fries ($9.95) has been increased from 4 ounces to 5 ounces. The "big and juicy" burger (8 ounces) is also available at $12.95. 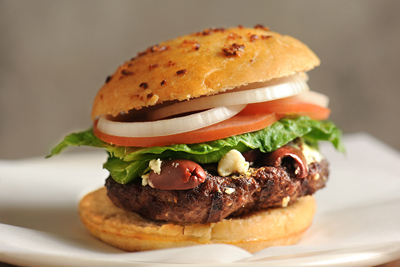 Each burger recipe is priced the same no matter if the guest chooses grass-fed beef, free-range chicken or turkey, or organic vegetarian (black bean, Portobello or walnut). However, there is a $3 up-charge for choosing Wild Alaskan Salmon, which is flown in from Alaska. All burgers now come with choice of homemade French Fries, Sweet Potato Fries, Carrot Sticks or Coleslaw included in the price. There are some other nice changes to the menu. The all grass-fed beef hot dogs are now served Chicago-style, with mustard, onion, tomato, celery salt, sweet pickle relish, sport peppers and a pickle spear. Sweet potato fries and homemade coleslaw are new options and there are also weekly specials like the Glencoe Burger (arugula, olive oil mayonnaise, tomato, and onion, ketchup and served on a house-made sesame bun) and the Great Gringo Burger (Corona beer marinated beef served with chipotle mayonnaise, tomato, ketchup, lettuce and grilled jalapenos). All condiments and produce are organic. On the dessert side, Everest Burger’s frozen yogurt is creamier than ever and they use real organic yogurt from Wisconsin in the recipe, unlike most other frozen yogurt that is made from powder. The kids menu continues to be popular and there are several improvements. Pasta and meatballs are now available as well as meatball sliders. The kids’ meals are served in delightful, artistic cardboard cars and trucks. Another big change has involved the menu presentation. "When our guests walk in, they view our large menu board on the wall behind the front counter," said Mark. "It lists all of our food choices, including our special recipes. The problem we had is that, originally, the menu board contained all text and no photos. We found that our customers had a hard time visualizing our burger creations and so ordering was too difficult. We’ve now designed and installed a brand new menu board, complete with color photos of the signature items. It’s bright and very appealing and ordering is much easier." To make ordering and overall service even better, Everest Burger has added full table service and free WiFi. Guests can now be seated in the dining room and a server will give them all of the service they need, including explanations of the menu items. "It’s a better experience for the customers and it gives us more opportunity to chat with them and get to know them so we can continue to make them happy. That’s what a neighborhood restaurant should be," said Mark. "People on the go can still order at the counter and then sit down; the food will be brought to them, ready to eat in the dining room or packaged for takeout." 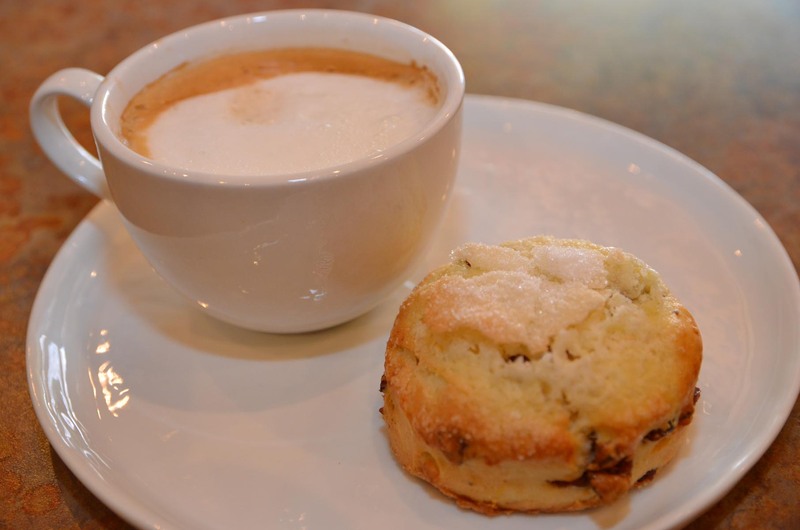 The restaurant has always prided itself on its homemade baked goods. 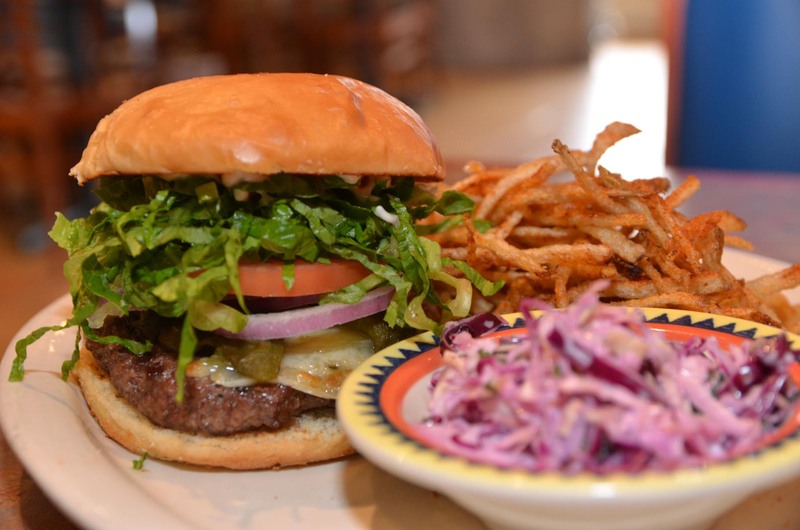 From the beginning, we’ve baked our burger buns from scratch, in-house," said Margarita. 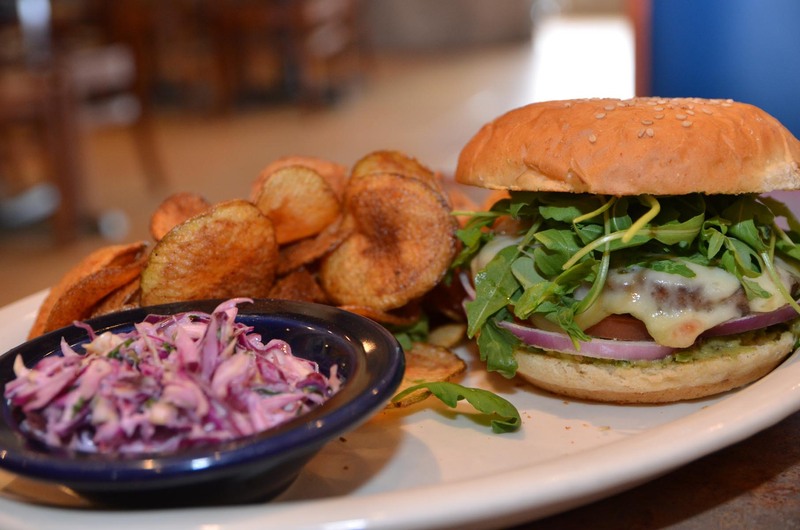 "We started out offering healthy, whole wheat buns that were delicious. But our customers told us they didn’t absorb the burger’s juices as readily as lighter white buns and the burgers were a bit too messy for some. After months of testing, we’ve designed a new, bigger burger bun, made from organic whole wheat white and unbleached flour. We didn’t sacrifice any flavor, though—they’re tastier than before. It’s a very good improvement." For those who prefer, Everest Burger still offers its sesame, whole wheat, vegan and gluten-free buns. The gluten-free buns are made from rice flour, buckwheat and flaxseed. Margarita tested several recipes before choosing this one. The bakery is also now the impetus for Everest Burger’s new breakfast service. 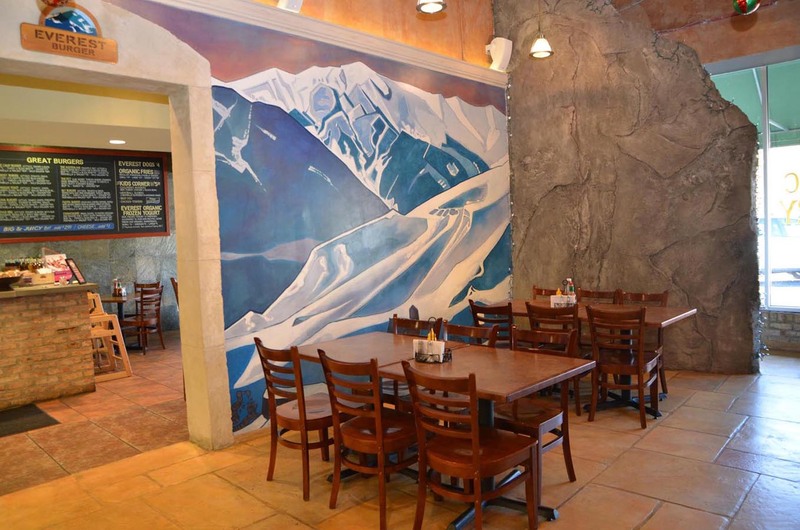 "Everest Burger, with its free parking, is a convenient stop for breakfast and we’re now offering some hearty breakfast entrées as well as a variety of wonderful pastries that are baked on premises," said Margarita. 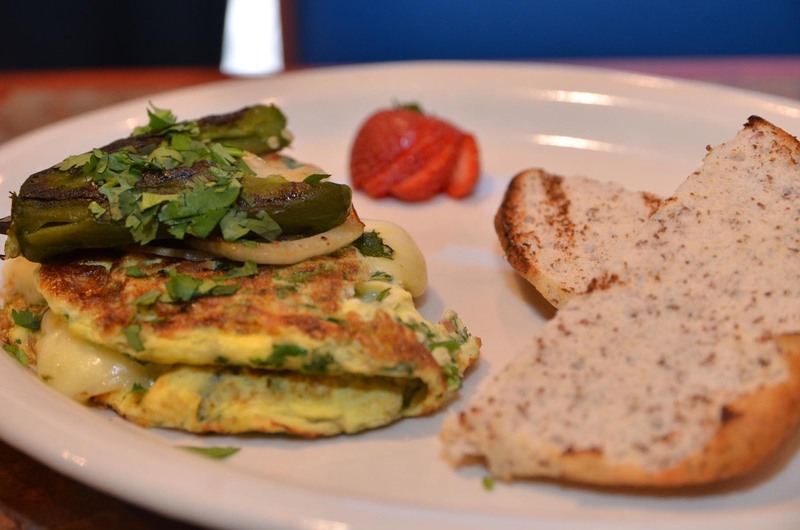 All egg dishes are prepared with free-range, organic eggs. The turkey bacon and sausage are hormone-free. Organic flour is used in the pancakes and waffles. "Together with our fresh juices and our new espresso and cappuccino service—using excellent coffee, I might add—we have become an attractive spot for people who want to get off to a great morning start." Everest Burger’s breakfast service begins at 8 a.m. The breakfast menu feature such items as the Breakfast Burrito, warm, flour tortilla filled with beef chorizo, black beans, scrambled eggs and cotija cheese ($7.95); the Everest Waffle, a home-made Belgian waffle with choice of strawberries, bananas or blueberries ($8.95); Blueberry Pancakes, three fluffy buttermilk or gluten-free buckwheat pancakes cooked with fresh blueberries ($9.95); Everest Pancakes, three fluffy buttermilk or gluten-free buckwheat pancakes cooked with shredded carrots, Granny Smith apples and raisins, and served with a side of plain yogurt ($10.95). Omelette choices include the Nova Lox Omelette, three eggs, lox, onion, tomatoes and cream cheese; Steak Omelette, three eggs, steak, mushrooms, tomatoes, bell pepper, onion and sharp cheddar cheese; Everest Omelette, three eggs with a wonderful mix of spinach, tomatoes, onions, mushrooms and avocado, and the Mediterranean Omelette, three eggs, roasted sweet bell pepper, tomatoes, Kalamata olives, parsley, fresh garlic, scallions and feta cheese. All omelettes start at $10.95. The bakery and coffee service are open all day and there are plenty of freshly baked cookies, cupcakes, muffins and brownies to choose from. The new and improved Everest Burger is just another step for the Challengers as they continue to refine their business and become increasingly involved in their community. "We love this area and we’ve been fortunate to have sponsored some local sports teams and other programs, said Mark. "We hope the community will continue to support us as well and, if they weren’t convinced their first time at Everest Burger, they should come back and give Everest Burger another try. We think they will be very pleased with version 2.0. We want to hear from our guests about what we’re doing right and how we can make our restaurant the place to go for delicious, healthy burgers, great breakfast and much more." Everest Burger is a better burger restaurant and bakery located at 91 Green Bay Rd., Glencoe, Ill. The restaurant and bakery is open 8 a.m. to 8 p.m. Sunday through Thursday, 9 a.m. to 9 p.m. Friday and Saturday. For more information, contact Everest Burger at (847) 242-0909 or online at www.everestburger.com. Fleming's Prime Steakhouse & Wine Bar (960 Milwaukee Ave., Lincolnshire, IL; 847-793-0333) is hosting a Qupe Winery Wine Dinner 6:30 p.m., Saturday, January 28. Qupe winemaker Bob Lindquist, one of the most respected producers on California's Central Coast and one the 50 most influential winemakers, as ranked by Food & Wine magazine, will be present to speak about the wines. to showcase the best of food and wine for the dinner. The evening starts with a passed appetizer reception featuring Sweet Chile Shrimp on Lotus Root and Endive Leaf Stuffed with Crab Salad paired with Bien Nacido CuvÃ©e, Santa Maria Valley, 2010. This is followed by the first course, Roasted Beet Salad with goat cheese and baby greens paired with Chardonnay Bien Nacido Y Block, Santa Maria Valley, 2010. The second course is Sesame-Crusted Salmon over braised swiss chard with Grenache Sawyer Lindquist Vineyard, Edna Valley, 2009. The third course features a delicious Filet Mignon with celery root purÃ©e and Syrah reduction. It is the perfect pair for Los Olivos CuvÃ©e, Santa Ynez Valley, 2007. Dessert is Chocolate Raspberry Mousse with Chantilly cream elegantly paired with Syrah Bien Nacido Vineyard, Santa Maria Valley, 2008. The dinner is $89 per person, excluding tax and gratuity and includes five wine pairings with four delicious courses and dessert. Reservations for the Qupe Winery Wine Dinner at Fleming's are required and may be made by calling (847) 793-0333. Bob Lindquist founded Qupe Winery in 1982 in southern California. From the beginning, he decided the winery would focus on making Syrah and varietals of Rhone wine, as well as Chardonnay. In 1989, Qupe partnered with Au Bon Climat Winery for space at the Bien Nacido Vineyard, where their grapes are still grown today. Qupe Winery has been honored with many awards, including being named one of Wine & Spirits Magazine's Top 100 Wineries in America eight of the last nine years. 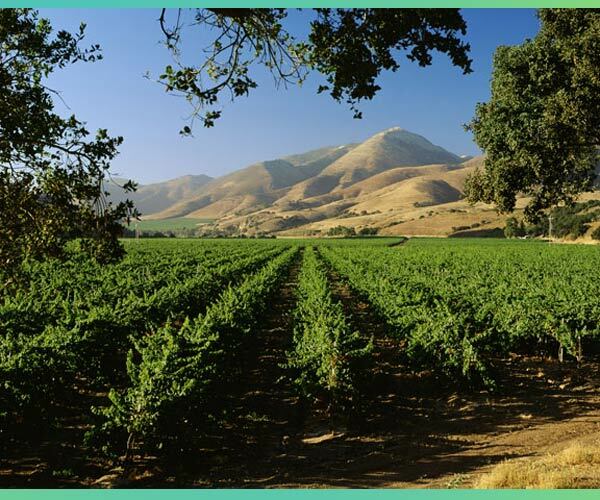 A Midwest native, Bob Lindquist has been working with southern California wines since the 1970s, and founded Qupe Winery in 1982. He is also a partner in Verdad Winery, a winery dedicated to Spanish varietals and run by his wife Louisa. They recently planted forty acres called the Sawyer Lindquist Vineyard, where they are starting the next chapter of their life. Lindquist has three grown children who work in the wine industry and lives in San Louis Obispo, California, with Louisa and their son Theo. Nationally acclaimed Fleming's Prime Steakhouse & Wine Bar offers the best in steakhouse dining -- Prime meats and chops, fresh fish and poultry, generous salads and side orders -- with a unique wine list known as the "Fleming's 100TM" that features 100 wines served by the glass. Fleming's was launched in Newport Beach, Calif. in 1998 by successful restaurant industry veterans Paul Fleming and Bill Allen. Today there are 64 restaurants nationwide. Fleming's is the recipient of numerous prestigious awards, including Wine Spectator's annual Awards of Excellence, and Wine Enthusiast's annual Awards of Distinction. While it may seem like this year just started, let’s not forget that Valentine’s Day is right around the corner. If you’re stuck while trying to come up with a way to show the special person in your life how much they mean to you, let us help. From decadent dining options to spicy Mexican meals, ways to celebrate the day with your children or gifts to spoil your sweetheart, here are our suggestions for celebrating the love in your life. With its ties to Paris, the City of Love, the Chicago French Market (131 N. Clinton St., Chicago, IL 60661; 312-575-0306) is the place to be to celebrate love this season. Delightful Pastries will feature raspberry linzer hearts, raspberry ganache tarts and decorated heart butter cookies for Valentine’s Day. If you’re looking for a more Parisian pastry, stop by Vanille Patisserie for their famous macarons. Light and sweet, these cookies are perfect for Valentine’s Day. For the traditionalist, Les Fleurs offers unique, handmade bouquets every day. You can’t go wrong with their fresh flowers for Valentine’s Day. For the traditional, you can also find the perfect chocolates are to spoil the one you love at Canady le Chocolatier. They are offering their beautiful nine-piece chocolates in a floral box for $22, and the more extravagant 30-piece floral box is $50. If you are looking for a plainer box, Canady also offers their 11-piece box for $17 and a one-pound box for $40. If you are shopping for a coffee lover, Lavazza Espression in the French Market is giving away a free cup and saucer with the purchase of a pound of their gourmet coffee for $14.75 or $15 through February 29. Lavazza also is offering decadent specialty coffees during February. The Meringato, espresso and Nutella crowned with whipped cream ($3.59), and the Strawberry and Strawberry Choco Nespressone ($2.95 to $3.75) are delicious ways to celebrate early. 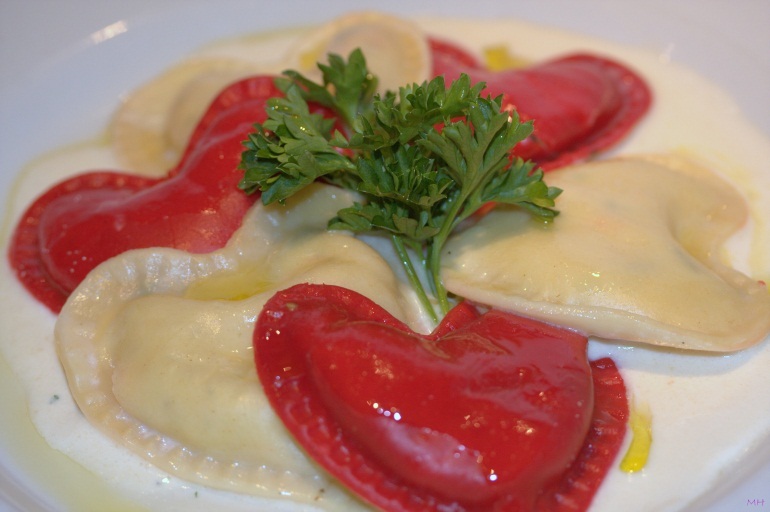 Lavazza also offers delicious food to celebrate Valentine’s Day. While they will have the more traditional Valentine’s Day Sugar Cookies ($3.99), they also feature a mouthwatering Torta di Cioccolato ($4.50), artisan crafted chocolate cake layered with raspberry and covered with ganache, and Crostata di Cioccolato ($3.99), an artisan crafted chocolate ganache tart. All Lavazza’s special Valentine’s Day food items are available January 23 through February 17. For a more luxurious gift, Abbey Brown Soap Artisan offers many handmade soaps, lotions and bath salts in an array of tempting scents. If you plan to celebrate the holiday with a little something bubbly, Pastoral Artisan Cheese, Bread and Wine has an array of luxury gifts available. Pastoral is offering a Caviar for Two Collection, a gift medley featuring a tin of Sturgeon Caviar from Italy; Picolo, a creamy California cheese; cocktail toasts and a bottle of L Mawby Blanc de Blanc. Additionally, they are featuring a Chocolat et Fromage gift box, which includes an enticing assortment of chocolates from around the world and two cheeses to pair with them. This box is also available with one of Pastoral’s wine selections. If you want to celebrate the holiday with the one you love before Valentine’s Day, Pastoral’s gift boxes are available at their website, www.pastoralartisan.com. The bakery at Everest Burger (91 Green Bay Rd., Glencoe, IL 60022; 847-242-0909) will feature delicious Valentine’s Day treats made on-site from all-natural ingredients. They will have heart-shaped Valentine’s Day cookies and beautiful strawberry cupcakes for $2 each. They’re the perfect treat to take home to your family or for kids to share with their classmates. Fat Rosie’s Taco and Tequila Bar (1890 W. Main St., St. Charles, IL 60174; 630-762-0235) is hosting their annual Amor Valentine’s Day Dinner 7 p.m. Tuesday, February 14. The dinner will feature Executive Chef Raul Arreola’s Recipes of Love and two Classica Margaritas. The Amor Valentine’s Day Dinner is $65 per couple, excluding tax and gratuity. Reservations are required. The Amor Valentine’s Day Dinner starts with Uchepos Gratinado, a corn tamale with poblano cream, melted cheese and esquites. This is followed by a choice of either Ensalada de Palmitos, hearts of palm with mixed greens and roasted red peppers drizzled in Cilantro Serrano dressing or Sopa de Chipachole, tomato chipotle broth with crabmeat and grilled asparagus. For the third course, diners can choose between Pescado Adobado, a fresh fish of the day served with Adobo sauce, roasted fingerling potatoes and baby spinach or Puerco in Mole Verde, pork loin in Oaxaca green mole with whole black beans and mashed potato. The meal ends with the delicious Chabelas Cake, a Tres Leches cake with fresh fruit and berry sauce. 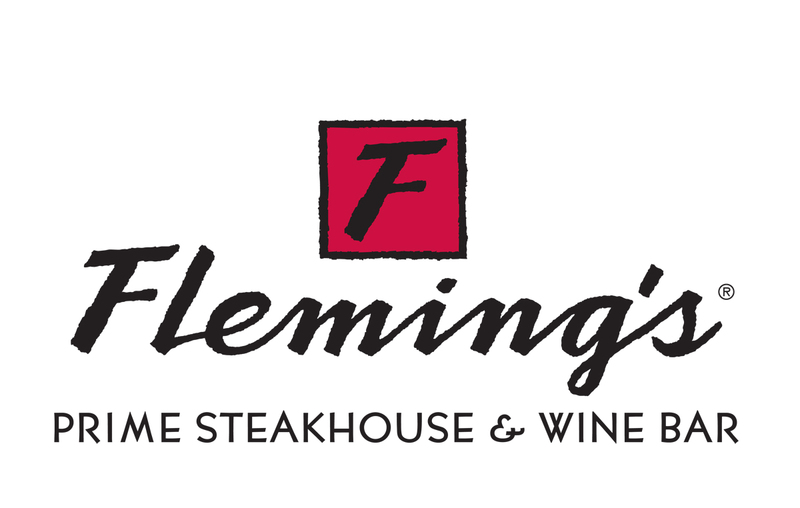 Fleming’s Prime Steakhouse and Wine Bar (25 E. Ohio St., Chicago, IL 60611; 312-329-9463 and 960 Milwaukee Ave., Lincolnshire, IL 60069; 847-793-0333) is extending their Valentine’s Day celebration from February 12 through 14. This is always a popular destination for Valentine’s Day, so make sure to make your reservations early. Each couple celebrating Valentine’s Day with Fleming’s these days also will receive a $25 dining card toward a future rendezvous at Fleming’s. Don’t miss out on this amazing offer. Fleming’s Valentine’s Day menu includes a three mouthwatering entrées, special wine pairings and a decadent dessert. Each Valentine’s Day entrée is $69.95. 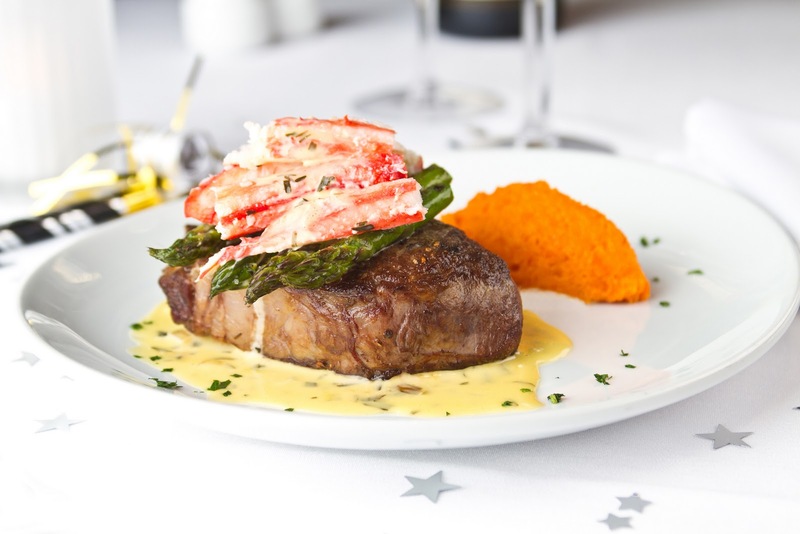 These special, decadent meals include Filet Mignon and Prawns, filet mignon on a bed of sautéed Portobello mushrooms and smoky bacon, paired with crab-stuffed prawns and a lemon garlic butter sauce; Prime New York Strip and King Crab, which is presented Oscar-style, topped with butter-poached King Crab, grilled asparagus and champagne béarnaise sauce and served with a sweet potato quenelle; and Lobster and Lobster, Colossal North Atlantic lobster tail with drawn butter and served with lobster mac and cheese. Finish this delicious meal with a luxurious dessert for two, Red Velvet Cake served with Espresso Truffles for $9.50. While you enjoy Fleming’s delicious Valentine’s menu, don’t forget the wine. Fleming’s recommended wine pairings for their holiday meal are Tiamo, Chianti Italy, 2010; Terra Valentine, Cabernet Sauvignon Napa Valley, 2007; and Roderer Estate, Brut Rosé Anderson Valley NV. Each wine is available by the bottle and by the glass. Fleming’s also is featuring special Valentine’s cocktail, the Bella-Tini. It’s a special way to toast to your Valentine. This bellini-inspired cocktail with Belvedere vodka, peach purée and Mas Fi Cava sparkling wine is $9.95 a glass. Make reservations for Fleming’s Valentine’s Day celebration by calling either the Chicago or Lincolnshire location or visiting http://www.flemingssteakhouse.com. Francesca’s restaurants locations are celebration Five Days of Valentines Friday, February 10 through Tuesday, February 14. During these five days, Francesca’s will feature Pizza con Prosciutto e Rucola, arugula, lemon, olive oil, roasted plum tomatoes, mozzarella and Prosciutto di Parma, for $11.99. They will also feature the festive Ravioli Tartufati, heart-shaped cheese-filled pasta with a garlic Parmesan cream sauce, fresh tomatoes and a drizzle of white truffle oil for $16.99. (This pasta will be available at all locations except Francesca’s Forno). Francesca’s special edition "Hearts on Fire" Martini will also be available for $9. This tasty drink is made with vodka, Cointreau, Aperol, Disaronno and fresh lemon juice. For dessert, Francesca’s offers beautiful Torta di Frutta Della Passione, a passion fruit tart with white chocolate cream and fresh berries. A Valentine’s evening at Franceca’s is sure to be a treat. Francesca’s Bryn Mawr (1039 W. Bryn Mawr Ave., Chicago, IL 60660; 773-506-9261) will be kicking off their brunch specials soon, but if you dine with them during Valentine’s week, February 10 through 14, you can receive a gift certificate for $10 off brunch at the restaurant, which can be redeemed from February 18 through April 15. Francesca’s on Chestnut (200 E. Chestnut St., Chicago, IL 60611; 312-482-8800) is offering a special menu for Valentine’s Day Diners. The St. Valentine’s Day Couples Special is $103.99 for four courses and a bottle of wine, not including tax and gratuity. The St. Valentine’s Day Cupid Special comes with a bottle of either MASI Modello Delle Venezie Bianco 2009 or MASI Mondello Delle Venezie Rosso 2008. Couples start the meal with Alaskan Snow Crab Claws, four crab claws over julienne lettuce and chives, served with honey Dijon mustard sauce to share. This is followed by the Francesca Salad, a delicious mix of romaine lettuce, endive, radicchio, blue cheese and fresh vegetables to share. Each diner may choose his or her own entrée from three delicious choices, including Braised Beef Brassato with potato gratinatti, crispy asparagus and natural juice, Pork Tenderloin wrapped in prosciutto with a bed of sautéed spinach and oven-dried tomatoes in an oregano wine sauce, or Mahi Mahi, almond crusted mahi with fennel, beets, baby greens, and champagne mustard sauce. This delicious and romantic meal concludes with Chocolate Mousse for the couple to share. Valentine’s Day celebrating isn’t just for adults! Francesca’s Fortunato (40 Kansas St., Frankfort, IL 60423; 815-464-1890) is celebrating Junior Cupid Day 11:30 a.m. to 5 p.m. Saturday, February 11. Parents are invited to bring their Junior Cupids in wearing pink or red, and they will get a complimentary special dessert with their meal. There will also be the opportunity to wine a $25 gift certificate to Toys R Us by guessing the correct number of Sweethearts in the jar. Planning to dine at Francesca’s Tavola (208 S. Arlington Heights Rd., Arlington Heights, IL 60005; 847-394-3950) the week of Valentine’s Day? The restaurant is offering a special personal touch for your Valentine’s Day. 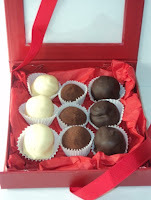 When making their reservation, guests can order a box of homemade truffles with a personalized note for only $10. It will be waiting at your table when you come to enjoy your Valentine’s Day meal. It’s a sweet, personalized treat to show your dinner companion just how much you care. Francesca’s at the Promenade (641 E. Boughton Rd., Bolingbrook, IL 60440; 630-739-6300) has partnered with Aloft Hotel (500 Janes Ave., Bolingbrook, IL 60440; 630-410-6367) to create a special romantic package for couples. Throughout the month of February, enjoy a one-night stay for two at Aloft Hotel and a fantastic dinner at Francesca’s at the Promenade for $199. With such a great partnership, we can be sure it will be an evening to remember. If you’re looking to keep the romance alive after Valentine’s Day, Francesca’s Tavola (208 S. Arlington Heights Rd., Arlington Heights, IL 60005; 847-394-3950) is hosting a romantic wine dinner 7 p.m. Thursday, February 16. The dinner will feature the wines of Buglioni Vineyards with aphrodisiac foods. The dinner is $55 per person, excluding tax and gratuity. Reservations are required. The evening begins with a cocktail hour featuring Ostriche di Amore, oysters on a half shell with a pomegranate mionette. This is paired with "Il Vigliacco" Brut Rose. The first course for the evening is Carciofi al Miele, shaved sunchokes on Romaine leaves with honey, roasted lemon and pecorini sardo paired with "Il Intruso" Bianco Veronese. Following this is Orecchiete de Rapini, orecchiete, rapini, roasted garlic and calabrian chiles paired with Alpolicella Classico. The third course is Costine Bue con Polenta, braised short ribs, creamy herbed polenta and asparagus. This is a perfect pair for "Il Bugiardo" Valpolicella Classicao Superiore Ripasso DOC. The evening of aphrodisiacs ends with Duo di Macaroon, an almond and walnut fig filled macaroon with gorgonzola dolce and date and raisin conserva. "L’Amarone" Amarone della Valpolicella is paired with the dessert course. Guests also receive homemade chocolate truffles to take home and continue the celebration. Guanajuato Contemporary Mexican & Tequila Bar (73 Green Bay Rd., Glencoe, IL 60022; 847-242-0501) will feature a special Cornish Game Hen with garlic spinach, black beans and smoky red salsa to share for $24.95 on Valentine’s Day. 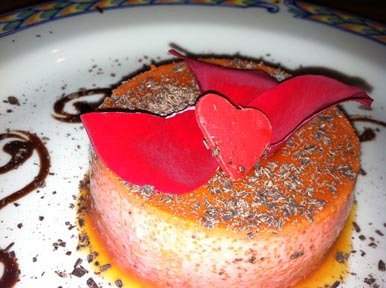 For a unique Valentine’s Day dessert, try Guanajuato’s delicious Strawberry Flan made with real roses for $9.95. A date night at Guanajuato would not be complete without one of their legendary margaritas. For Valentine’s Day, Guanajuato is featuring their amazing Prickly Pear Margarita and a Blood Orange Margarita for $10. The restaurant also will have live music on Valentine’s Day and be open until 10 p.m. To treat your Valentine an authentic, romantic trip south of the border while staying on the North Shore, make sure to visit Guanajuato. For the art lover in your life, or for a unique and beautiful gift, visit the Judy A. Saslow Gallery (300 W. Superior, Chicago, IL 60654; 312-943-0530). 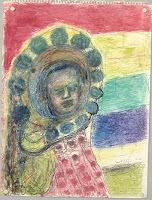 Currently, the gallery is displaying outsider art as a part of its Far Out: 2012 show. When you make a piece from this show part of your home, your Valentine will always remember this year as a special one. Whether your loved one desires a painting, a print or a sculpture, the Judy A. Saslow Gallery has an array of lovely options. The gallery also showcases intricate handmade jewelry. 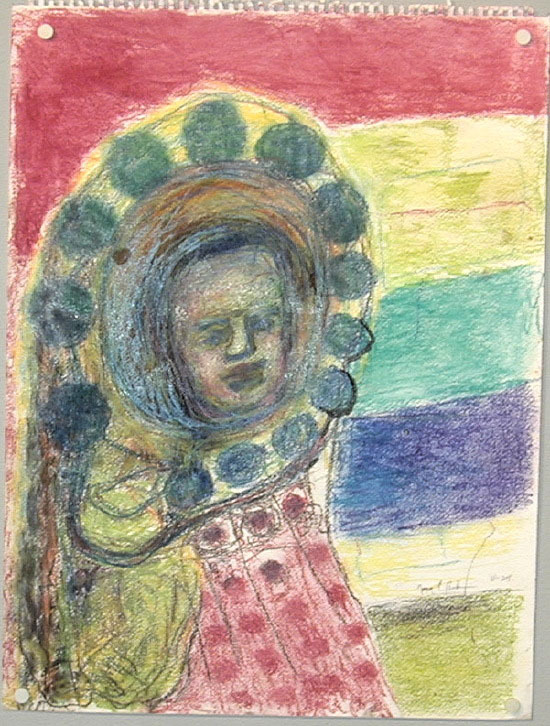 Visit the Judy A. Saslow Gallery Tuesday through Friday 11 a.m. to 5 p.m. and Saturdays 11 a.m. to 6 p.m.
Maxwell’s at the Club (500 N. Kingsbury St., Chicago, IL 60610; 312-527-5800) will feature a special Valentine’s Day menu in addition to their normal a la carte menu 5:30 p.m. to 9:30 p.m. February 14. This prix fixe menu is $40 per person, not including alcohol, and includes an appetizer, salad, entrée and dessert. Entrée selections include steak and lobster tail, seafood and chateaubriand for two. Dinner guests may also attend the Valentine's Day Party Riverview from 6 to 10 p.m. at no extra cost. This party includes a hors d'oeuvres buffet, cash bar and performance by cover band Midnight Sun. The cost of attending the Valentine’s Day Party without Dinner at Maxwell’s is $30 per person. For dinner reservations call Maxwell’s at 312-527-5800, extension 301. Prairie Grass Cafe (601 Skokie Blvd., Northbrook, IL 60062; 847-205-4433) has Valentine celebrations available for diners of all ages. February 13, children are welcome to come in for dinner and decorate cookies for their parents. Each child will receive three heart-shaped cookies, one to eat and two to give away. They will decorate them using Prairie Grass’s house-made, all natural frosting and receive a card to decorate and box to present it in for just $14. It’s a great way for them to show their parents love. If you’re looking to make naturally colored icing at home, why not borrow a recipe from Prairie Grass? You’ll need two cups of powdered sugar, two and a half tablespoons of heavy cream and a small beet, coarsely grated. Blend the sugar and cream with a hand mixer until smooth and stir in the grated beet a little at a time until reaching the desired color. Press the icing through a fine sieve to remove beet strands. Prairie Grass also is featuring a special Valentine’s Day menu of February 14. The menu features half-dozen Oysters Rockefeller for $15. Delicious Shrimp Cakes with tomato chutney, forbidden black rice and crunchy vegetable slaw make a delicious entrée for $26. Prairie Grass will also feature Bison Filet Mignon as an entrée with sweet and savory potato gratin and "River Valley Ranch" mushroom ragout for $42. Prairie Grass’s specialty dessert offerings include the PGC "Date" Cake, rich cake infused with Medjool Dates and covered in a sticky toffee sauce, topped with homemade vanilla bean ice cream for $7.50 or their famous Mom’s Cherry Pie, featuring Door County Sour Cherries for $7.50. The Valentine’s Day Sparkler, Prairie Grass’s special holiday cocktail, is made with a dash of Angostura Orange Bitters, half an ounce of Mathilde Raspberry Liquor and five ounces of Prosecco. 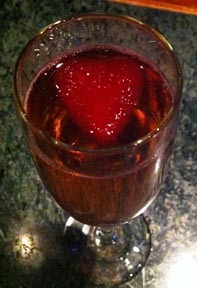 It is garnished with a delightful raspberry juice ice cube in the shape of a heart. For $11, it’s a great cocktail to celebrate the holiday. Prairie Grass Cafe’s unique and tasty menu is perfect for a memorable holiday with the one you love. Francesca’s Cabernet Wine Dinner celebrates "our favorite red grape." Kelley Joerns of Chateau St. Michelle Estates will be on-site to speak about the wines during the evening. This six-course meal is $52 per person, excluding tax and gratuity. Reservations are required. The evening begins with a cocktail hour where Francesca’s will be serving their delicious Crostini assortiti. The first course of the evening will be Filetto di Pesce all’aroma di Nocciolee Insalatina di Camp, hazelnut crusted grouper with baby greens in a beurre blanc Sauce, which is served with Antica Chardonnay 2009. This is followed by Arancini alla Valdostana, a rice ball filled with prosciutto, fontina and sage with smoked roasted tomato sauce and bitter greens. Conn Creek Cabernet 2008 makes a great pair for this course. The third course features Stracci della Nonna, hand-made pasta sautéed with braised pork, herbs and parmigiano, and it is paired with Hands of Time 2009, a Bordeaux blend. Bistecca con Cipolline e polenta, charred London broil with gorgonzola polenta, cipollini onion and asparagus spears is the next course. It is paired with Col Solare 2006, another Bordeaux blend. The evening ends with Biscotti e Caffe, assorted cookies and coffee. How many of you listen to the radio during lunch? If you’ve been following the banter on WGN radio, you know that John Williams is being treated as a second class radio personality to the big buck Garry Meier and Jonathan Brandmeier. We love both of them, but really guys, John Williams deserves a break. No marketing budget for John Williams billboards – resort to PR. Our clients at Francesca’s Bellezza in LaGrange LOVE you and John, they’re in your backyard (at home--you do live in LaGrange, right?). They’ve enlisted us (Kurman Communications), their pr team, to get on the bandwagon. So here’s to you John. Everyone, email your “Sign of Faith – I Listen to John Williams Weekdays 12-3 pm WGN Radio” and show WGN and John your love. And John, call your #1 fan, Francesca Bellezza manager Michael Bassarab and he'll kick in a dinner for four to the lucky "best sign" winner. Francesca's telephone is (708) 579-3500. Superstar songstress and academy award winning actress, Jennifer Hudson is making her way back to her home city! With her new book fresh off the press, the Chicago-native will be making a stop at Barnes & Noble at the Westfield Old Orchard Shopping Center (55 Old Orchard Center, Skokie, IL 60077, 847-676-2230) for a book signing 7 p.m. Tuesday, January 17. 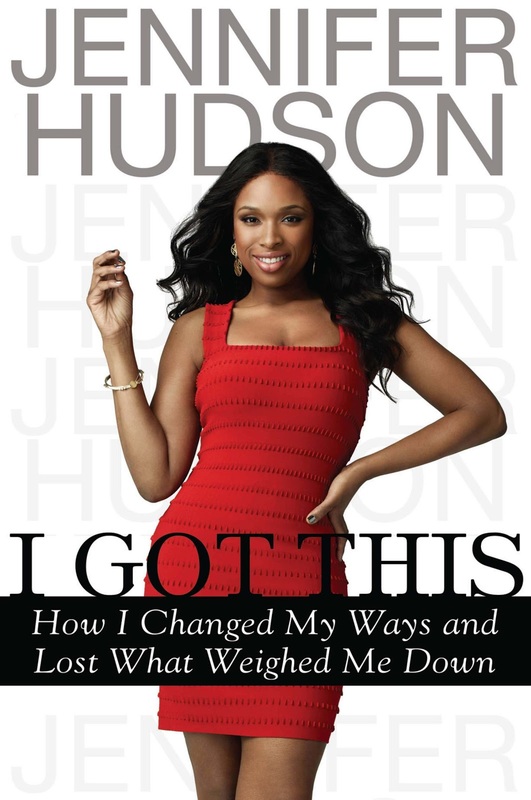 Her book, entitled, “I Got This: How I Changed My Ways and Lost What Weighed Me Down," highlights her struggles with weight loss; and how she in the process of learning to live a healthy lifestyle. We first fell in love with Jennifer during her stint as a contestant on American Idol back in 2004 and watched as she catapulted to superstardom in both music and acting. In addition to her lucrative career, she is now a spokes model for Weight Watchers and has reportedly lost 80 pounds! Come be the first to get your own copy of her new book signed at Westfield Old Orchard Shopping Center. Free numbered tickets will be given out beginning at 4pm to customers with a copy of Hudson’s new book and proof of purchase from B&N or bn.com. Customers also will be allowed to have up to 2 CDs signed; these items must be purchased at B&N Old Orchard on the day of the event. No other memorabilia will be signed. Only the first 300 people will be guaranteed a signed book. Ms. Hudson will sign more than 300 only if time allows.